The month-long Spring Yak Tribe tournament is moving right along. We are at the halfway mark of the tournament and it is still anybody's game to win. 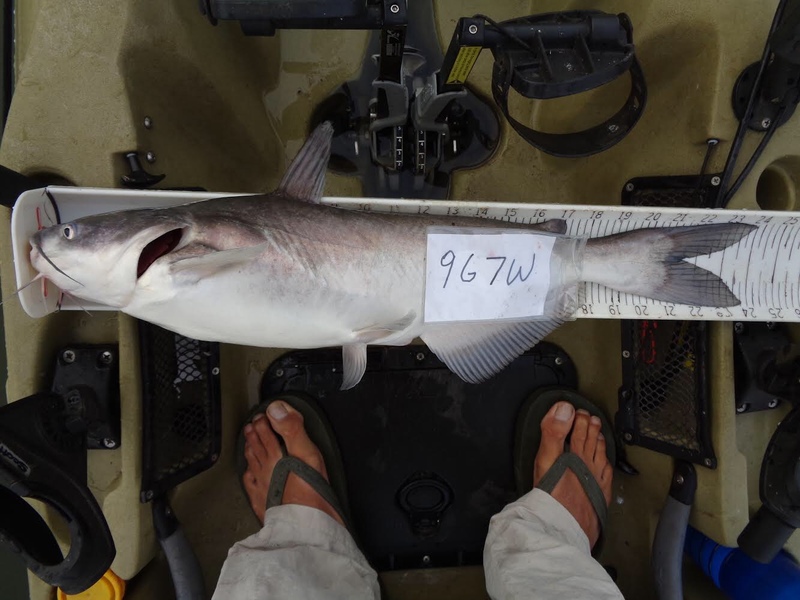 As of writing this post, I am currently in third place with 210.75". It is still way too early to get complacent though. There will be a lot of movement at the top of the leaderboard as we get closer to the end. Over the last week, I did improve my score by a few inches. I managed to finish out my slot fish limit and cull another one of my smaller fish. I still have a 23.25" fish that I would like to replace with one closer to 24" though. The big issue for me has been locating and catching the size of fish I need for the over slot portion of the tournament. My two over slot fish are 34.75" and 33.5" respectively. It hasn't been for lack of trying. In the last two weeks, I have drifted several miles of the river looking for them. 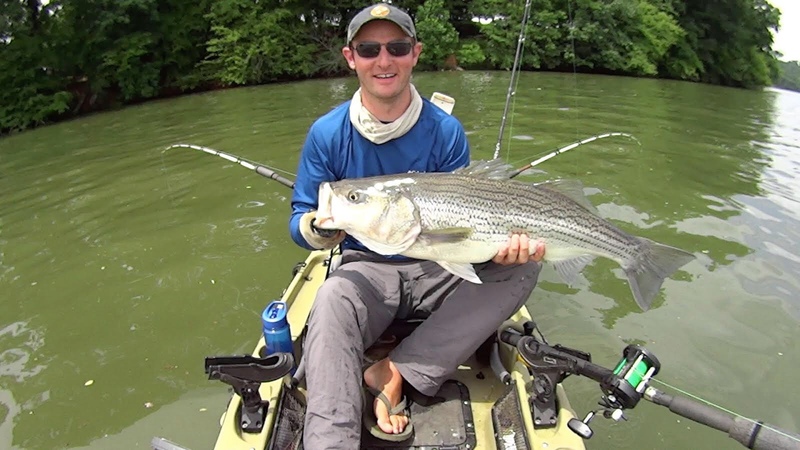 While I have caught a ton of fish, most have been in the 5 to 15lb range. I did hook into one tank which somehow popped the hook a couple minutes into the fight. That fish will haunt me if I don't end up placing high in this tournament. My guess is that our bigger blues are already on the beds here. With our water temps where they are, I would have thought I had more time before they spawned but nobody in this area seems to be catching bigger blues with any consistency right now which leads me to believe that they are already spawning. If this is the case, my best bet for this tournament is going to be catching a flathead or striped bass to improve on my over slot score. 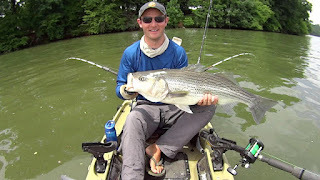 I was able to get on some striped bass over the holiday weekend but the biggest one I landed was 33.5" which wasn't big enough to replace the fish I had previously submitted. Catching those stripers was an absolute blast though. 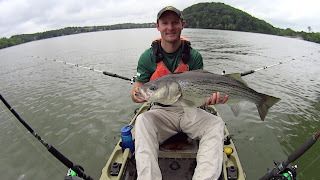 They are a fun fish to catch in the kayak. I am going to stay after them the next couple weeks. Like I said above, this is still anybody's tournament to win. There is plenty of time left for everyone to improve on their score. You can guarantee I will be putting some time in to try to make it happen in these next two weeks. Thank you to everyone who is following along as I fish this tournament. I appreciate all the support and well wishes.